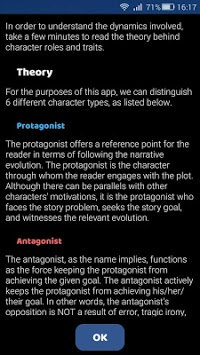 Helps fiction writers analyze characters, narrative evolution of their book. 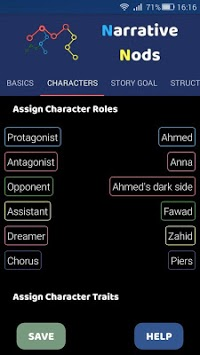 Narrative Nods is a story development app that helps fiction writers transform their ideas into coherent, powerful plots. Taking into consideration a vast number of variables from information the user provides about characters, structure, and the overall story goal, it creates narrative possibilities ("nods") that assist the author in selecting dynamic, sense-making plots. How do the protagonist's character traits affect the story? In which way does the character role of the opponent influence the creation of a narratively solid novel? And how do narrative choices and journeys affect the ending of the book? 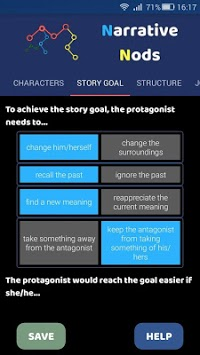 Narrative Nods helps you make critical decisions about your story, at the same time explaining in a clear, easy-to-understand manner the literary theory behind these storytelling decisions. The developer is a published author with a PhD in English literature.